Baechu is so pretty.. I look so ugly next to her.. It's fascinating enough for us to bump into each other in the rest room, turns out we were also in the same plane. -As expected, pretty girls hang out together..
-Whoa.. 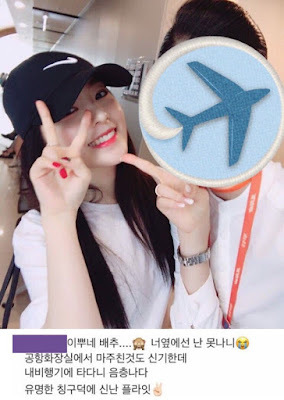 If her friend is a flight attendant then she must be really pretty..
-Whoa.. Bae Joohyun is really beautiful.. She's not a human..
-Whoa.. Is it possible for a person to look that beautiful? -This reminds me of Chanyeol..ㅠㅠ He also once bumped into his friend at the airport..ㅋㅋ By the way, Irene is so freaking beautiful.. I love her..
-Bae Joohyun is so freaking beautiful.. I heard that Joohyun originally had an interest on becoming a flight attendant back then.. Am I wrong?